Nectarines are a fuzzless variety of peach that grows from the same tree as a peach. Contrary to popular opinion, it’s not a cross between a peach and a plum. They originated in China over 2,000 years ago and were cultivated in ancient Greece, Rome, and Persia. “Nectarine” means “sweet as nectar,” referring to its taste. Now let’s jump into your nectarine options. This nectarine is very large and has a skin that is pale-yellow with red blushes. The flesh itself is white in color and has a rich, sweet flavor. It is a freestone variety of nectarine that is ready to be harvested in mid-season. Medium-Sized fruit with pale-yellow skin and white flesh, the Arctic Rose is very rich and sweet with a taste that you’re not likely to forget anytime soon. Arctic Star nectarines are very large fruit with bright-red skin and white flesh. They bloom early and have a wonderfully sweet flavor. Armking nectarines are average-sized and can be either round or slightly elongated. In fact, they sometimes appear to be irregular in shape because the shape can vary so much. They have a beautiful orange-red color and yellow, moderately firm flesh. Their taste is a little on the acidic side, and the stone has somewhat adhered to the flesh. A small to medium fruit, the Desert Dawn has sweet, firm, juicy flesh and a wonderful scent. It also has dark-red skin and yellow flesh. This fruit is medium-sized and has dark-red skin and yellow flesh. It matures in mid-season and has a very sweet taste. You can easily recognize this type of nectarine due to its bright-red color and perfectly oval shape. The Early Sungrand nectarine has yellow pulp with red streaks, and the stone inside is firm and fairly large. Fairlane nectarines are very large and have red-over-yellow skin. Their flesh is yellow and it is a late-season fruit. With a large size and slightly oval shape, the Fantasia nectarine is bright-red in color and has yellow pulp with red streaks. It is a very tasty and juicy nectarine with a firm texture and yummy flavor. This is a semi-freestone nectarine from California and is large and red. Its skin is smooth and juicy, and it has a delicious flavor. This is a medium-sized fruit with flaming-red skin and firm yellow flesh. It hales from California and is extremely sweet in taste. The Flavortop nectarine has red flecked skin and golden-yellow flesh. The flesh is also streaked with red, and it matures in mid-season. It is a California variety of nectarine. These nectarines are a freestone variety from New Zealand and have white flesh and red-over-white skin. It is a very large fruit, and it matures in late-season. 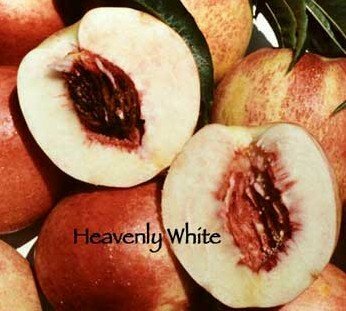 Large in size with creamy-white skin, the Heavenly White nectarine has a white flesh that is adored by nectarine-lovers. It is a freestone variety that matures in mid-season. This is an oval-shaped nectarine that is average in size and bright-red in color. Its flesh is yellow with red streaks, and it is a delicious-tasting nectarine with a large stone. This is a medium- to large-sized fruit and has white skin tinged in crimson-red. Its greenish-white flesh is delicious, and it originated in England. It matures late in the growing season. Medium in size, the June Glo nectarine has red skin, a yellow flesh, and an excellent flavor. It is a freestone variety that matures early in the growing season. The Le Grand nectarine is very large in size and is yellow with streaks of pale-red. The flesh itself is pale-orange with a little red next to the stone area. It has a yummy taste and a firm texture. This one gets its name because it matures late in the season. It is medium in size and has a taste that combines just the right amount of spiciness and sweetness. It has yellow flesh and red-over-yellow skin. This nectarine has a slightly elliptical shape and is also fairly large. It is red in color and when it comes to maturing, this is one of the earliest-harvest nectarines in existence, which means you can enjoy it very soon after it is planted. This is a medium-sized nectarine that has dark-red skin and yellow flesh. Its taste is quite good, and it is a freestone variety that matures in mid-season. These nectarines are average to small in size and have a somewhat elongated shape. Its red color is very intense, and the flesh is yellow with red streaks and has a fantastic flavor. Morton nectarines are small and round with an intense red color on the outside and white flesh on the inside. In fact, when it comes to commercial varieties of nectarines, the Morton is one of the few with these specific characteristics. The Nectar Babe nectarine matures in the middle of the growing season and has dark-red skin and yellow flesh. Its taste is yummy, and it is small to medium in size. You can harvest these nectarines in early- to mid-season, and they are a medium to large size. They also have red skin and tasty, very sweet flesh. This nectarine is spherical in size and has an average thickness. It is a vivid-red color which covers roughly 75-percent of the surface of the nectarine, and its flesh is yellow and semi-firm. With a round shape and average thickness, the Nectared 4 nectarine is firm and has a yellow flesh that is outstanding in flavor. Of all of the Nectared nectarine varieties, this one is usually considered the most flavorful. The Nectared 5 nectarine has intense-yellow flesh that is firm and tastes fantastic. Like other varieties of this nectarine, the Nectared 5 is spherical in shape and has an average thickness. It is also unique in that its production can be somewhat irregular, which means it is not always available. This is an average-sized fruit with a vivid red color covering almost the entire surface. Its flesh is firm and has an intense yellow color, and its taste is absolutely delectable. With a round shape and average size, the Nectared 8 nectarine is a beautiful shade of red and has a greenish-yellow background. Its flesh is firm and yellow-orange in color. These nectarines are average-sized, but they have an intensely red color. With a stone that is easily delivered from the flesh, it has firm flesh that is yellow in color and very tasty. Panamint nectarines are a freestone variety from California. They are medium in size and have bright-red skin and yummy yellow flesh. These are small- to medium-sized fruits with thin yellow skins and yellow flesh. They are a freestone variety that originated in California and mature in mid-season. The Red June nectarine is small to average in size and has a spherical shape. Its dark-red color covers the entire surface of the fruit, and its flesh is yellow with red streaks. It has a slightly acidic flavor and a firm texture. This type of nectarine is a bright-red color and is very large in size. The flesh is orange-yellow in color, and it has a high-quality taste. Ruby Grand nectarines are very large and have ruby-red skin. Their firm yellow flesh is delicious, and they are ready to be harvested in mid-season. A small, round, bright-red fruit, the Silver Lode has flesh that is white. It has a very tasty and full flavor. The Snow Queen Nectarine is very large and has fair, red-flushed skin. It has juicy, fine-textured white flesh, and it matures in early-season. This is a large fruit with yellow skin and yellow flesh. A freestone variety, the Southern Belle can be harvested early in the growing season and has a great flavor. The Stanwick nectarine is medium-sized and has greenish-white skin with tinges of purple-red. Its flesh is white and very juicy. The Stanwick is a freestone variety that is ready to be harvested late in the season. 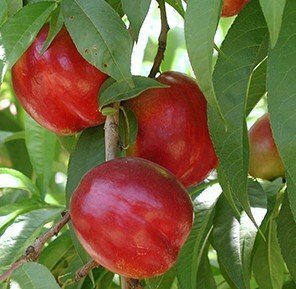 The Stark Red Gold Nectarine is very large and round in size, and most of the outside of the skin is a bright red color. It is a very strong fruit and has vivid-yellow flesh. The Stark Sunglo nectarine has an average thickness and a slightly oval shape. It has skin that is bright red in color and firm, yellow flesh that has an extraordinary taste. This type of nectarine is very large and has yellow, red-blushed skin and very tasty, yellow flesh. Hailing from California, this fruit is ready to be harvested mid-season. This one has skin that is white in color flushed with red, and its flesh is white, juicy, and very sweet. It matures in early-season and has a very creamy texture. This nectarine is a vivid-red color and is oval-shaped and very large. Its flesh is yellow but it turns to a deep red color when it gets close to the pit, which is also quite large. Best for coastal southern states such as Florida, Texas, and Louisiana, the Sun Home nectarine has beautiful, tasty, yellow flesh and beautiful foliage that blooms in the spring. It can handle some cool temperatures, and it does best in zones 8 and 9. These nectarines are best when grown in zones 8 and 9, and they have white, tasty flesh and the ability to handle some cold temperatures, as long as they don’t get too cold. With yellow flesh and a delicious flavor, this type of nectarine is resistant to a lot of diseases and does best in zones 8 and 9. As long as you don’t keep it in the cold for too long, it should grow well. This is a relatively small fruit with a round shape. It is bright red in color and has yellow flesh and a tasty flavor. With an unusual name, this type of nectarine is very large and has red-over-yellow skin. Its flesh is firm and extremely tasty, and it is a freestone variety that blooms in early- to mid-season.